Hello again! I hope you have had a chance to check out the new blog here on GoPens. 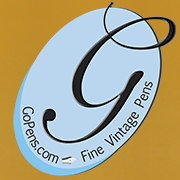 Gary and Myrna are currently expanding the GoPens community to try and help more vintage pens find their perfect homes. You can now find GoPens on Facebook, so if you’re a Facebooker, please head on over and give GoPens a like! What is your favorite vintage pen? Is there a vintage pen you’re looking for? Leave a note, leave a post, let us know!